As I mentioned on some recent posts, I made a couple of visits downtown to SXSW this year. It started last Friday and I took the day off, both because of the event and because it was the day before my birthday. Conveniently, SXSW and spring break in Texas, always seems to fall around my birthday. 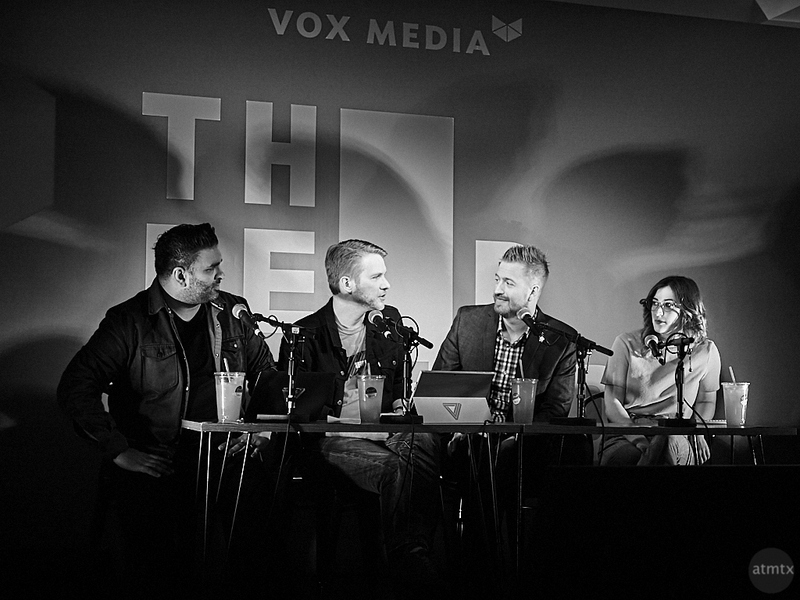 I headed over to The Belmont, where Vox Media decked out the place for three days of events. First up was a podcast from The Verge, which is a tech industry and gadget website. They broadcasted their Vergecast live from Austin, as seen here. It was embarrassingly fun. Which made me realize how much of a tech nerd I am, which I usually don’t talk about on this blog, where I’m also, obviously, a serious photography nerd. It was a fun time hanging out with tech and media people and, certainly, the open bar was a big plus. That, and some photography, made for some nice pre-birthday fun. I’ve shot a lot of black and white recently, but this one was really out of technical necessity, not of artistic creativity. The lights on stage had horrible color-casts and the LCDs, harsh. I opted for a monochrome to create a decent image. At least one with, no shocking colors, reasonable contrast and brightened shadows. I’m sort of a geek…or at least I hang out with computers all day. I should probably be embarrassed that I’m not familiar with The Verge. Yeah, but you don’t like computers.